C1658. PIERRE MONTEUX Cond. 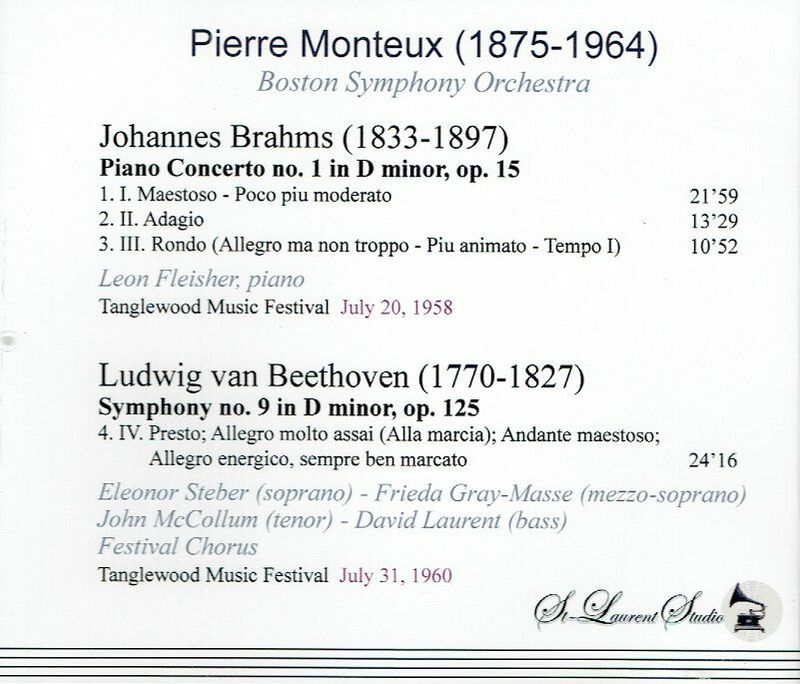 Boston S.O., w.LEON FLEISHER: Piano Concerto #1 in d (Brahms), Live Performance, 20 July, 1958, Tanglewood [a profoundly sensitive performance . . . in outstanding sound! 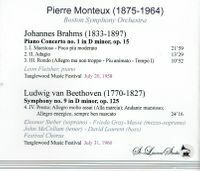 ]; w.Eleanor Steber, Frieda Gray-Masse, John McCollum & David Laurent: 'Choral' Symphony #9 in d - Final Movement (Beethoven), Live Performance, 31 July, 1960, Tanglewood. (Canada) St Laurent Studio YSL T-552. Transfers by Yves St Laurent. "A piano, which produces a tone by striking strings with a felt-lined hammer, should not be able to sustain a legato as gorgeous as what Fleisher coaxes from the instrument. The next thing you realize is that this sound is not just a clever effect but it makes the music come to life and clarifies textures in a way that seems utterly fresh and utterly right. That's the magic of Fleisher the pianist." "No American pianist can equal [Fleisher's] combination of subtle phrasing, intellectual mastery and interpretive depth." "Steber definitely possessed the most glorious instrument of all, with its classically organized technique, impeccable management of breath support, easy agility and, above all, that phosphorescent top register. She was a singer who possessed a rare combination of vocal radiance, technical mastery and personal charisma, and during her best years, the distinctive purity, spinning tone and easy sweetness of her soprano [which] made her the Mozart-Strauss soprano of one's dreams." 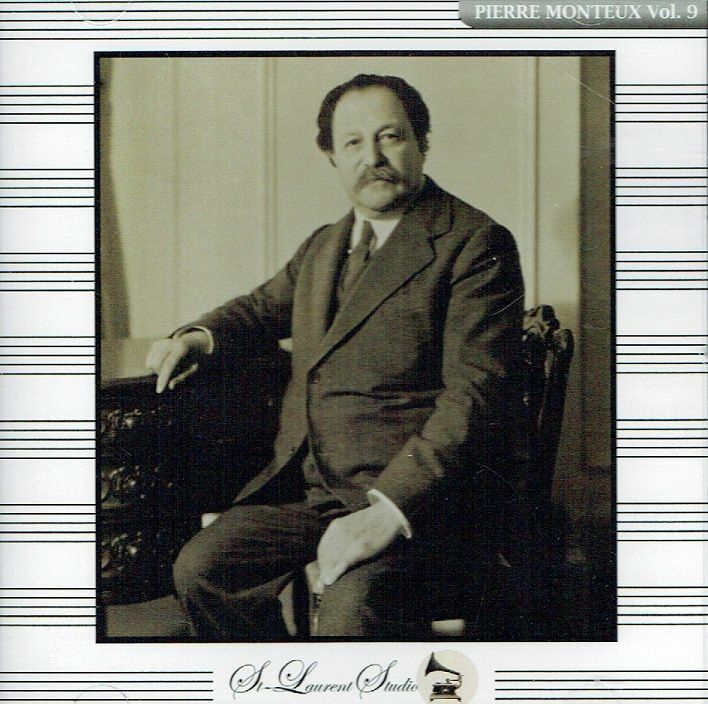 "Pierre Monteux had one of the longest musical careers in memory, exceeded perhaps only by Pablo Casals and Leopold Stokowski. He retained a youthful appearance (and a full head of black hair!) well into old age, and he was well loved by colleagues and audiences alike.